SPECIAL FEATURES OF B.T.C. 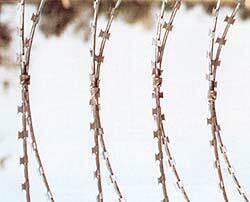 "SPIRAL FLEX"
The barb rips and grabs, unlike the prick of standard barbed wire. 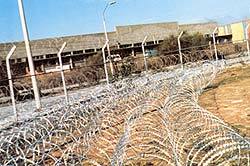 There are 3-4 times more points per meter than barbed wire. The core wire cannot be cut with ordinary tools. The spring steel also ensures that the coil holds its shape. "SPIRAL FLEX" lends itself to installation along an existing border fence or wall where at low cost the security can be greatly improved. "SPIRAL FLEX" provides for a wide variety of installation configurations, any one of which may be selected to meet the degree of security required, according to the need at any particular site. "SPIRAL FLEX" provides a light barrier and is thus easy to ship, transport and deploy. "SPIRAL FLEX" follows ground contours and can be rapidly installed without posts or straining wire, see pyramid formation. 1) The weak link in some brands of barbed tape is the clip which binds the wire into its tubular / concertina shape. Α weak clip will part, providing an easy access point for the intruder. 2) "SPIRAL FLEX" barbed tape incorporates a unique heavy duty steel clip 10mm wide Χ 2mm thick with overlapping joint. This cannot be parted by hand or with ordinary tools. Approx. diam. when extended in mm. Recommended maximum length in m.
Recommended installed length for more effective dense fencing in m.